Philadelphia is an absolute treasure trove of photography locations! 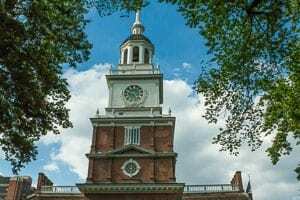 The city is probably best known as the location of Independence Hall and the signing of the Declaration of Independence. There is in fact a vast number of historically significant places which have been beautifully maintained, preserved or rebuilt. The city also boasts some incredible arts and culture venues, and a virtually endless source of visual inspiration. 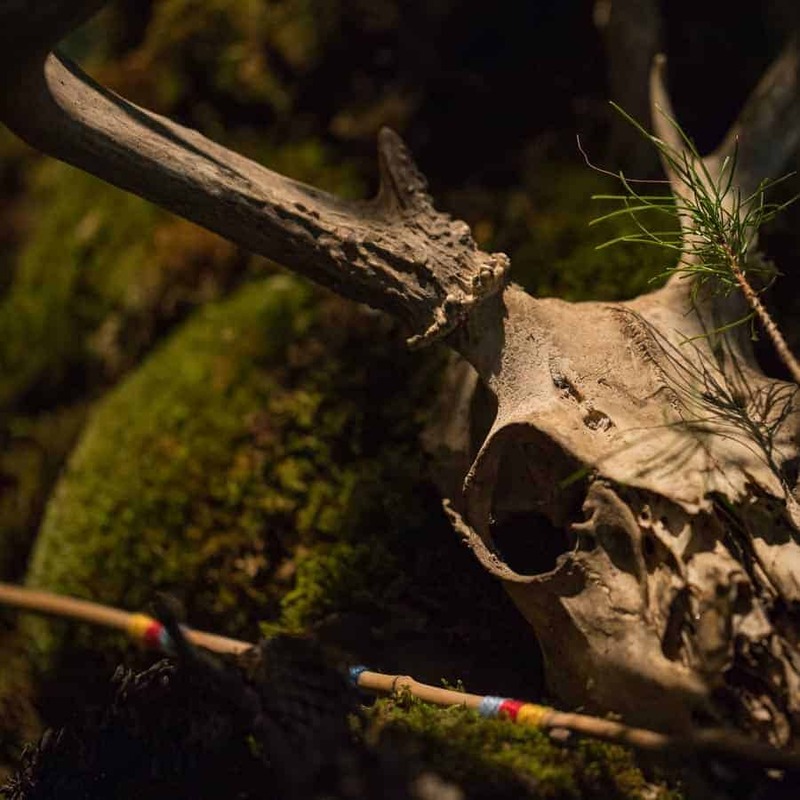 In preparing this guide, I was unable to physically visit each and every location for new photography. But I have lived in the area for over twenty years, and have a large array of past photography from around the city. In addition, I'm going to list a number of locations with links to their own websites, for further viewing. This article is somewhat obsolete now. Since posting this article a year ago, we released an iPhone/iPad app of all the best places to photograph in Philadelphia (and around the world). It' s a free app called Really Good Photo Spots and you can download it right here. The spots in this article are in the app, but also there are MANY MANY more in the app than in this article. The app is essential for photographing Philadelphia because you can just tap “Spots near me” at any time while out shooting and BOOM! You see all the best spots to take pictures near there. It's pretty cool. Philadelphia has a superb public transit system. Septa (locally known as Schlepta,) runs two main subway lines in the center of the city. There are also trolly lines, bus lines and regional rail train lines. The city is basically very similar to any other large east-coast city in terms of navigation by car. The older parts of town have fairly narrow streets, but the main thoroughfares are very large. As with any big city, be prepared for some fairly ‘aggressive' drivers. The number one rule of thumb is to always assume that you are the only sane one on the road, and you will probably be correct. Keeping that attitude, and watching out for the other guys, you should be able to get around quite easily. If you are staying right in Center City, Philadelphia, a great option is Philadelphia Bike Share. 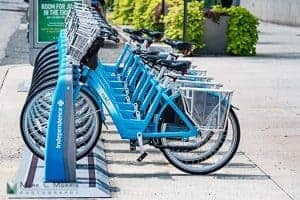 There are tons of stations around town where you can pick up a bike, and drop it off when you are finished. The Philly Art Museum is iconic from the outside as the building where Rocky ran up the stairs. There is actually a statue of Rocky located outside the building. 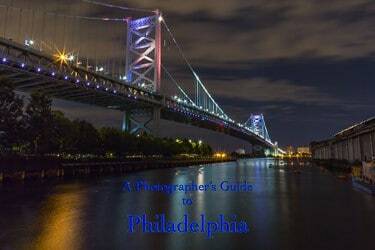 It is absolutely stunning architecturally, and it's a magnificent place to get some photographs of Philadelphia. The image to the right was taken from west of the museum, across the river, in a small emergency pull-off where you aren't actually supposed to get out to photograph. The key is not to get caught! The lighter colored building in the lower portion of the frames is the Fairmount Water Works. On the opposite side of the building are the famous “Rocky” steps. From atop those steps, one can take a fantastic cityscape of Philadelphia's center city skyline. The museum is at the end of a boulevard which is incredibly wide and majestic. As you look away from the museum, and down the boulevard, there are a great number of national flags from around the world, and the unique building that is Philadelphia City Hall. The view is spectacular at night, when you capture the lights of the city. Long-exposure photography in this spot is great because Logan Circle traverses the bottom of the stops, and you can capture the lights of passing cars and vehicles. JFK Boulevard is also lined with many trees. The foliage in the Fall isn't exactly stunning compared to what you would find outside the city, but it can be nice at times in Autumn. Spring is also a lovely time as the trees are becoming green. They can be a bit of a stark element in winter photos from this location. 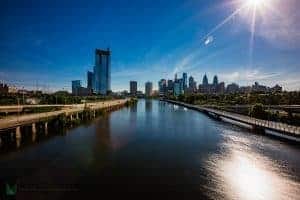 The Schuylkill River (locals pronounce this Skoo – kul), runs between Center City, and West Philly. On either side of that river are two Drives which are absolutely lovely roads. On the East side lies Lincoln Drive, and on the West is Kelly Drive. 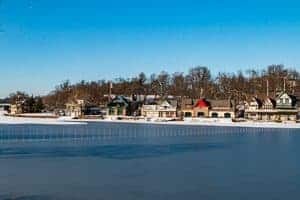 There are many spots on Kelly Drive where you can get a lovely photo of the Boathouses for the rowing teams for the various local institutions that train for rowing on the Schuylkill. There are boat races on the water many weekends in the Spring and Fall. The most famous of these is the Dad Vail Regatta. I have never actually attended or photographed this event, but it is an iconic Philly event, and I'm sure I will get there at some point. If you happen to be visiting Philadelphia when this event is occurring, it would be a high interest time/place! The photo I have included is a daytime photo while the water is frozen over, but the night images of this location are tremendously popular. The houses are completely bedecked in lights, and the reflections in the water can be stunning. One down side – there has been less coordination of colors of the houses lately than in the past. Fairly often some houses will be set at a very cool color balance, while others are extremely warm. At times, there has been variation within the various strands within each individual property! At other times, they coordinate and the outcome is absolutely amazing. It's essentially a roll of the dice in terms of color. For the recent Democratic National Convention they were set up in Red, White and Blue, and looked incredible. Another vantage point for this bridge is in a somewhat less accessible spot. This particular location is probably not one that I would recommend attending after dark. It just has the “feel” of a lot of unsavory things taking place. The ground is absolutely littered with trash, and there is plenty of evidence of drug use/illicit activity. However, it does present a fantastic view of the bridge, as well as some magnificent urban landscapes at the pier itself. 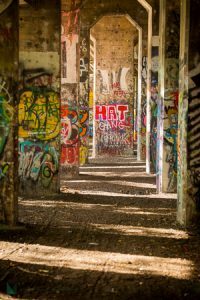 I have used Graffiti Pier for a portrait location in the past. It has a very “edgy” vibe to it, from all of the graffiti and the overgrown trees and plants. These plants are not immune to the graffiti artist's work. There are many spots where it's really fascinating how the painted crumbling concrete of an old abandoned industrial pier can be combined with the texture of painted tree trunks and leaves. There is a main North/South corridor through center city, which is Broad Street. It's actually the same as 14th street, but NO Philadelphian every looks for 14th street. The city starts with “Front” street along the Delaware River, all the way to the East. It then progresses in a numerical grid as the city expands westward. There is no “14th” street, just Broad. 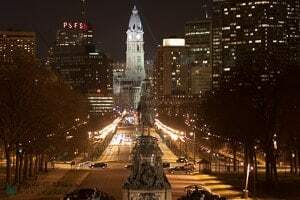 The areas just North and South of City Hall have been named “Avenue of the Arts.” This includes a number of arts institutions including the Kimmel Center, which is the home of the Philadelphia Orchestra and many other cultural institutions. In that same area is the campus for University of the Arts. Both of these edifices are great photography subjects. The Kimmel Center is a very modern building with sweeping arched glass ceiling, and an extremely sleek, sophisticated architectural style. The University of the Arts buildings are old Industrial Age buildings, but they have been flood lit to look spectacular at night. There is a fairly standard “wedding shot” that is done (i.e. overdone) with the bride and groom kissing in the middle of the road on the Avenue of the Arts, with Philadelphia City Hall as the background. Of course I only say that it is overdone because I have never had a bride and groom that have wanted that shot. As soon as I do, I'll be running down there at night with them for sure! The historic area of Philadelphia includes a number of buildings of historical and visual significance. Probably the most important of all of them is Independence Hall. This is the building where the signers of the Declaration of Independence met, and signed that document. The Liberty Bell is located in the Constitution Center, which is right in the same area. Carpenter's Hall, Betsy Ross's House, and a number of other major tourist destinations. These buildings are all open to the public. Most of them are operated by the National Park Service, and you can tour and see both interior and exterior locations. 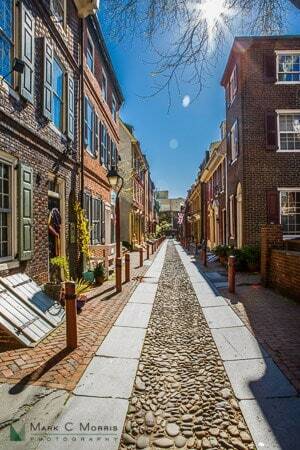 One of the oldest residential streets in America, this location maintains the real look and feel of an 18th-century street in Philadelphia. It is a National Historic Landmark, and the homes have been preserved and restored in authentic fashion for the period it was built (1702.) There are a fairly substantial number of small streets in the “Old City” part of town, but none of them has any more accurate look than this. Just a fair disclaimer – I photoshopped out a couple of real estate signs that were hanging on a couple of the buildings. 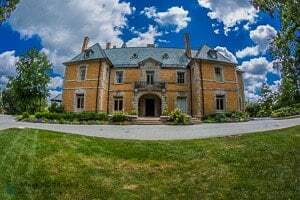 These are still private residents, so they do come up for sale from time-to-time, if anyone is looking for a really cool place to live in an incredible piece of history. This street is located along the eastern edge of the city, between Race & Arch Streets (between Front & Second.) There is a museum located on the street, which is made up of two of the homes. The other 30 homes are still residences. At 12th and Filbert Streets you will find one of the most crowded, sensory-overload type places in Philly. The Reading Terminal Market was originally a railroad terminal, with a farmers market inside. There are tons of stalls from the farms just outside of Philadelphia in Bucks, Montgomery, Chester, Delaware and Lancaster counties. A number of the stands are owned by Mennonite and Amish farmers from Lancaster County, which offers a bit of a photographer's dilemma. On the one hand, some sects of their religion prefer not to be photographed. On the other hand, they appear prominently in the marketing materials for the Reading Terminal Market, and it is clearly a “touristy” place, where there is an absolute plethora of photography going on. It is an amazing place for street photography and for seeking out a “hustle & bustle” type of vibe. This would be an absolutely ideal destination if you get stuck with bad weather on a day in Philly, and want someplace with a wide variety of “things to do” all under one roof. It is also adjacent to the Convention Center in the center of town. If you happen to be in Philadelphia for a convention, this is literally across the street from the hotel/convention center. An absolute MUST see/experience. This is almost as important as the photography information. When you are in Philadelphia, you will be obliged to find a “Philly Cheese Steak.” In reality, Philadelphians tend to consider the cheese steak as a 2nd tier, tourist sandwich. If you want to have an entirely authentic Philly sandwich, what you are looking for is a Philly Roast Pork. I strongly suggest with sharp provolone and hot peppers (although be careful… depending on the shop they can be so hot it can almost take your head off.) But inside Reading Terminal Market is one of the top two Roast Pork sandwiches on the planet Earth. Tommy Dinic's is absolutely out of this world. He also happens to be VERY friendly with photographers, and has allowed me to shoot at his stand more than once. Skip the cheese steak, and have this for lunch. Every day. I alluded to the fact that there might be one better. That is because nobody can touch John's Roast Pork. This location is really far out of center city, and in an industrial (i.e. not particularly photogenic) part of town. If anything else is taking you to deep south Philadelphia (like the sports stadiums) then you could justify a trip over there. But if you are on a photo trip, this might be a bit far off the ‘shot list.' However… if you are a foodie as well as a photography geek, you wont be sad to take the trip down there. Just get there early. 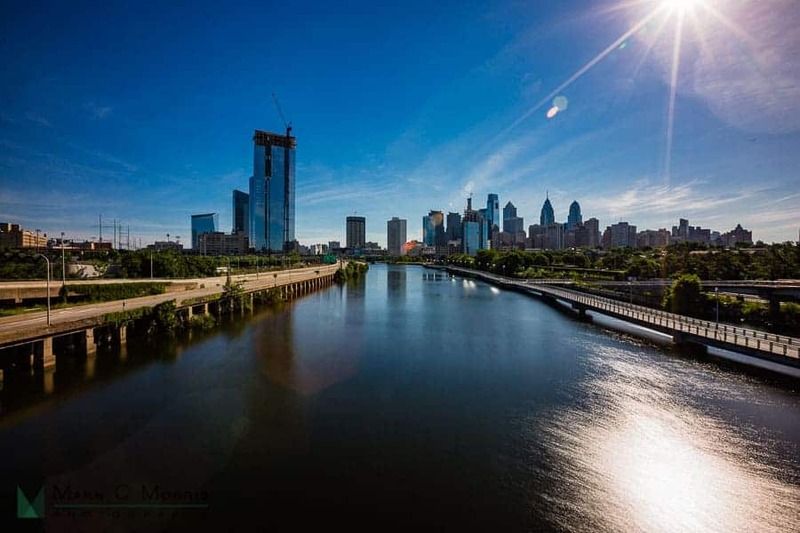 At 30th & Chestnut Street (the area is called University City because Drexel and University of Pennsylvania are both right there,) you can get free access to a park that was built atop the 11-structure next to a very tall sky scraper. This park, Cira Green, is basically a “green roof,” but it also offers some magnificent views of the city. It's also a phenomenal spot for a photo shoot. The photographers and athlete in this image were actually utilizing the space to do a fitness shoot on the day I visited to take a photo for this article. They were gracious enough to grant permission to photograph them working. 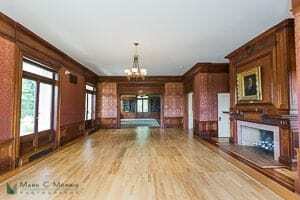 This space is available as a wedding venue, for anyone who is helping to plan a destination wedding in Philly. It would make quite a nice garden venue in good weather. The first two sky-scrapers in Philadelphia are One Liberty Place, and Two Liberty Place. Just recently, there was an observation deck opened at One Liberty. This observation deck is located on the 57th floor of Philadelphia, and some of the images from there are just breathtaking. I have planned several different days to go shoot at the observation deck, and each time the sky/light have simply not cooperated. Thus, I don't have a photo to offer just yet, but it is extremely high on my list of Philly locations to shoot. When I do get there, I'll edit this article and include it. There are some spectacular images on their website which is linked above. 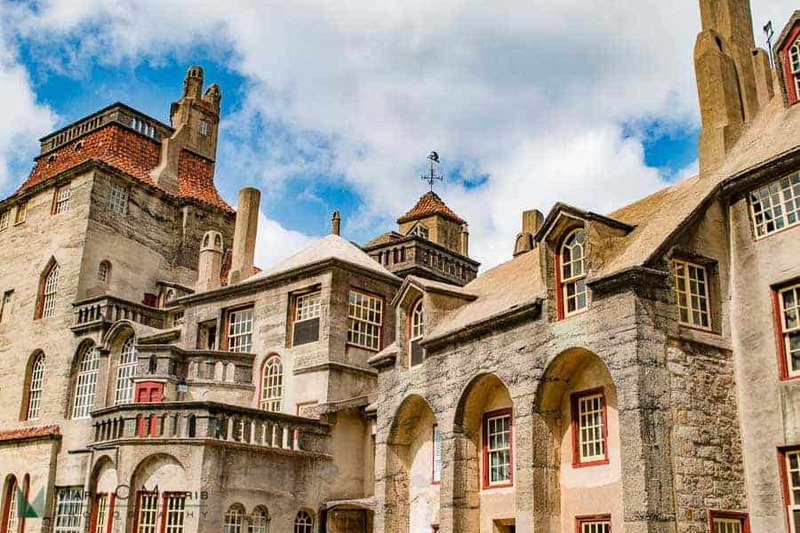 Fonthill Castle was built by Henry Mercer, who founded the Mercer Tile Works. This building and the adjacent tile works museum (which is still producing tile in the authentic manner, operated by the Historical Society of Bucks County,) are incredible treasures of the American Arts & Crafts Movement. Photography on site at Fonthill is by permit only. They try to strictly enforce this, so it would be highly advisable to reach out to them and obtain the appropriate permit prior to driving there. For those interested in photographing truly unique architecture, this place is absolutely amazing. Henry Mercer started the castle with an old stone farmhouse (the three-arched building slightly right of center.) He removed the roof, and then built off both sides of that farmhouse, to create an actual ‘castle.' There were no blueprints, he just built rooms and sections as he felt they should exist. 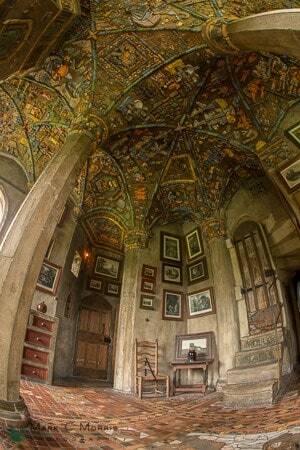 The interior is absolutely covered with tile. Interior photography is far more restricted than exterior. I was granted access for 60 minutes, in order to obtain some images that I could share with the readers of www.improvephotography.com. Here are some of the interior rooms. The tile work, and built-in furniture, along with the other remarkable detail in this building make it an incredibly exciting place to photograph. This is also used as a wedding venue. 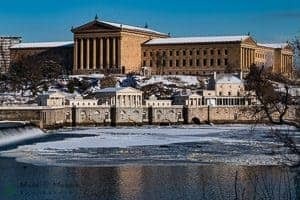 Again, if there is anyone helping a couple to plan a destination wedding to Philadelphia, this might be just the unique type of place for a couple that happen to also be history geeks! The exterior grounds are stunning, and there are large event tents located outside for the wedding activities. Bryn Athyn Cathedral is a remarkable building located in the small village of Bryn Athyn, PA. The cathedral looks very much like a traditional European cathedral. Photography on this location is strictly limited and controlled as well. I did not have access to shoot the cathedral itself, but I did have access to the other two buildings, Glencairn Museum, and the Cairnwood Mansion. These are immaculately maintained estate type homes. The Museum has a fairly broad assortment of historical items on display. 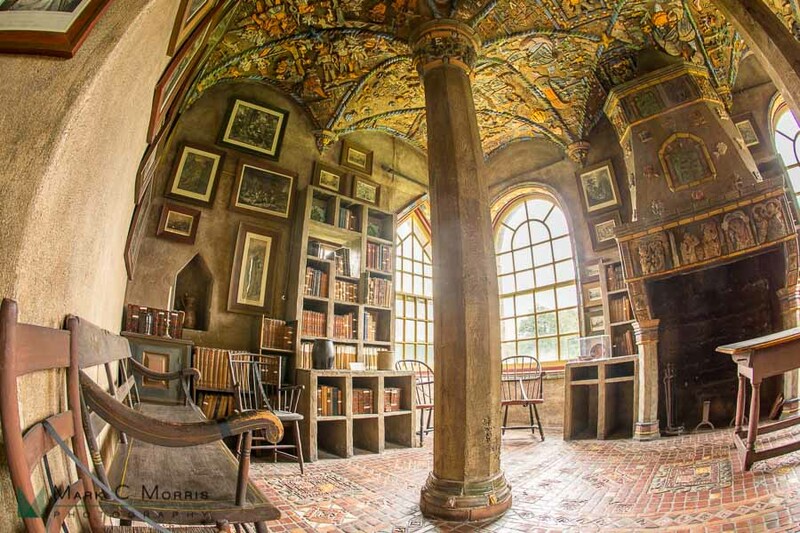 Their collection might not rival the Philadelphia Museum of Art, but it is quite impressive! Next door is the Cairnwood Mansion, which is rented out for weddings/events. Once again, if there is anyone working with a couple for a destination wedding, this in many ways feels like you are in Europe. 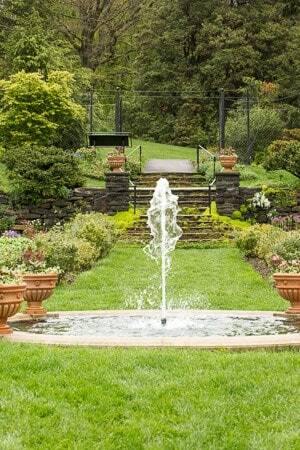 The gardens, the structures, and the surroundings are just stunning. In Chestnut Hill, PA, which is actually still within the city limits of Philadelphia, but has a distinctively “suburban” feel, there is a magnificent arboretum. This place was originally the estate of John & Lydia Morris. The estate building is gone, but the grounds are absolutely spectacular. They collected trees and plants from all around the world, and cultivated a collection that is now cared for and maintained by the University of Pennsylvania. 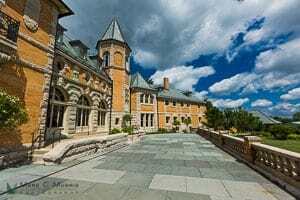 The entire Chestnut Hill area is well worth a visit, but the Arboretum is incredible in the Spring and Fall. 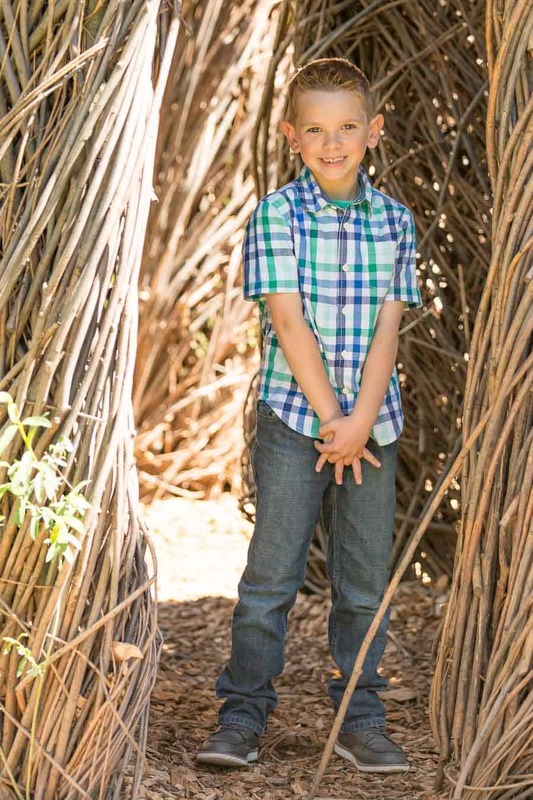 I use this venue for family portraits quite often, and have never been questioned regarding professional photography equipment on site. In addition to the many wooded areas, fountains, stone walls and walkways, etc., there is also a “Fernery” which is a greenhouse devoted purely to the growing of ferns. 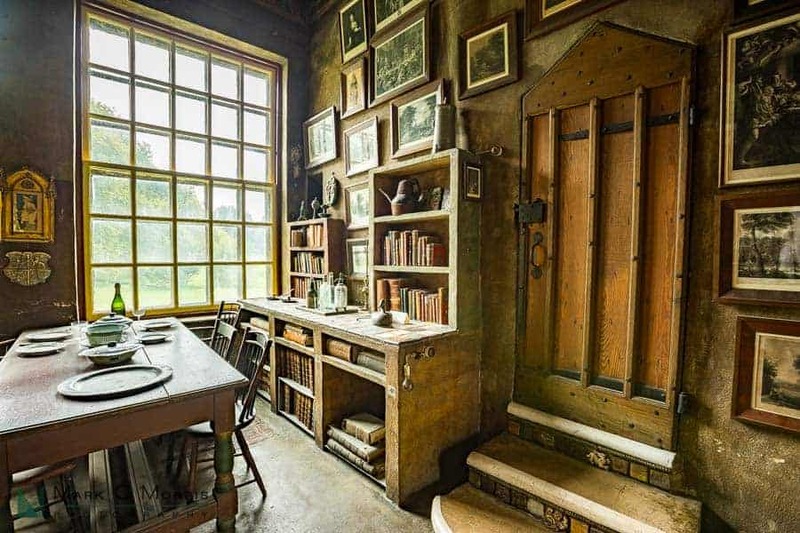 For anyone who enjoys macro photography of plants, this is a very enjoyable room. My final location is actually not a location, but rather an event. The Philadelphia Flower Show takes place every year in the Convention Center. This is a fantastic event, especially over the first weekend. The show generally runs for around 10 days. They open on one weekend, then stay open throughout the following weekend. This past year I attended both the opening weekend, and the closing weekend, and the flower displays were vastly better looking on the opening weekend, which only makes sense. I arrived right at opening time, and tried to get through ahead of the crowds. It does get VERY crowded, and you will definitely not be the only photographer. I took only my 100mm Macro, and the first time through I took a monopod, which I felt was actually getting in my way more than it was helping. The second time I went back, I left the monopod in the car. The flower show has a wide array of displays, not just “flowers.” The thing that I really enjoy about photographing their displays is that in general, a tremendous amount of effort has been spent arranging some extremely dramatic lighting. 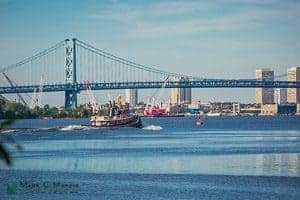 I'm sure I have just scratched the surface, so I would love to welcome fellow Philadelphians or those who have visited and have a favorite Philly location to add ideas in the comments! 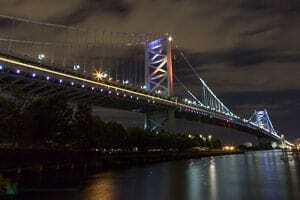 And if you find yourself heading to Philly and want to arrange a photo tour, feel free to reach out! If I am available, I absolutely love to show photographers around this amazing city I call home!